What Is My Proper Draw Weight? Hi, I am a 48 years old man. My height is 184 cm and my weight is 80kg. I have a 25 inch Hoyt HPX bow riser, with 38lbs long size Hoyt F7 limbs. My draw length is 30.5 inch and measured draw weight of this bow is about 45.5lbs. Is this bow draw weight heavy for me? And if I should reduce my draw weight, what limb weight is suitable for me? Comments for What Is My Proper Draw Weight? 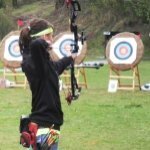 Proper draw weight can only be determined by the archer or a qualified instructor or coach who has the ability to observe the archer. 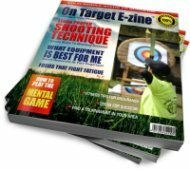 Without watching you shoot I can not determine if your draw weight is too heavy or even suggest a different draw weight however you can test yourself. Assuming that you are shooting with proper form including alignment and anchor position a simple test is to see if you can shoot 30 consecutive arrows without deterioration in form. If you can shoot 30 arrows without becoming fatigued then you’re shooting enough arrows to continue to build strength and improve your shot cycle through 1 to 1.5 hour long practice sessions. If you find your form is deteriorating or you can not achieve proper alignment or hold at anchor after fewer than 15 shots then it may be that your strength needs to be improved or you need a lighter draw weight. There are other methods to test an archer to see if they are properly sized (draw weight) but again it takes a qualified instructor or coach who can observe the archer. If you would like distant coaching please contact me to make arrangements.